Going off-road can be a lot of fun and make us feel invincible as we drive through rugged and rough terrains, but sh*t happens even the most careful driver, or off-road expertise will fall into an occasional scrape. Whether wedged between two rocks or mired in deep mud, the extraction process might be unpleasant and can bring a feeling of frustration and even desperation. However, one can avoid this situation by deploying th pulling power of a winch. This hauling or lifting device will pull you out of that deep mud and tight hole and do what a jeep, large truck or SUV couldn’t do. So even though you might not need them, winches are something you should always have in your car. This guide is about the best winch on the market. Here is a review of the best product on the market. The best people to ask about off-roading experience should be an off-road enthusiast. Basil Smith off-road enthusiasts built Smittybilt. Smith was one of the 4WD enthusiasts that built his company based on his driving days experience. 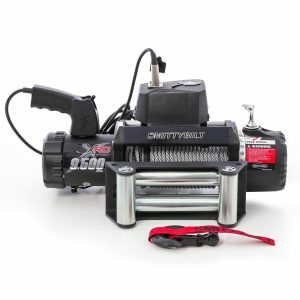 Due to his years of experience, Smittyblit XRC Winch was specially designed to manage about 9,500 lbs of pull rated loads. This winch is fully loaded with 3 stage Planetary gear system and 6.6 HP Amphibious motor. The winch has an IP67 waterproof rating which is one of the highest ratings in the automotive industry. Many users praise the Smittybilt winch for is the ability to work in both high and low terrains. The package comes with all the required wiring for installation and a corded remote. This kit remains the best you will see in the market that combines high quality with an affordable market price. The Smittybilt XRC 9500 winch is reliable and won’t disappoint you. The 9500 lb winch is built with high-quality materials and that will last for an extended period. Considering the performance and superior design the Smittybilt company offer a lifetime warranty on mechanical parts. After all, the company trusts this product to last an extended period. The XRC winch offers the best features way ahead of other products in the market. The Smittybilt XRC 9500 uses synthetic rope, dependable 6.6 HP motor to provide the best service for users. The package comes with a wireless remote which allows users to operate from a safe distance and a dynamic braking system to ensure safety. The Smittybilt XRC 9500 performs faster than other products in the market. One of the few things to consider when buying the best winch in the market is the power or line pull rating. This is the combination of the straight line and the mechanical capacity of the winch. The Smittybilt XRC 9500 was specially designed to manage about 9,500 lbs of pull rated loads. This pulling power is one of the highest you will get in the market. Always remember to check the weight of your car before making any purchase and remember the line pull rating can also affect the performance of your winch. The Smittybilt XRC 9500 has managed to take care of any potential problem. Winching can be quite messy and dangerous if not done in the right way. The Smittybilt XRC 9500 is equipped with a remote control which allows the user to operate from a safe distance. The material used in manufacturing a winch determines its durability and versatility. The Smittybilt XRC 9500 has was built with high-quality materials and has an outstanding feature which ensures durability in all weather condition. The winch has an IP67 waterproof rating which is one of the highest ratings in the automotive industry. The Smittybilt XRC 9500 with built with the best quality material that ensures the winch last for an extended period. With outstanding features like weather, sealing ensures the winch is durable in all weather condition. The company offers an extended five-year warranty on electrical parts and a limited lifetime warranty on mechanical parts. The Smittybilt warranty gives you the freedom of using the product without the fear of breakdowns. The company offers the best warranty. Cable size: 94′ Length 5/16″ Diameter. Remote controlled; more comfortable to use. The Smittybilt must regularly be maintained for efficiency and higher performance. There must be regular inspection and maintenance of connections, rollers, and handles of the winch. Always be vigilant and check the nick and fray line for maximum performance. Clean off dust, leave and dirt with water and soap. Read and follow the instruction manual on how to clean the winch effectively. The Smittybilt winch has one of the highest ratings on Amazon with an average 4.1 from a possible five. Most customers praise the product for its durability and high performance. The Smittyblit winch worth every penny spent on it. The Smittybilt is an outstanding winch with a pulling power of 9,500 lbs. This winch offers the best performance featuring a 3 stage planetary gear with fast line speeds. The winch is strong, durable and UV resistant. The winch has an amphibious 6.6 horsepower motor, waterproof and has a remote control. The remote control assists in operating the winch from a safe distance. The Smittybilt remains the best in the market that combines quality with affordable market price. The Smittybilt package comes with everything you need for installation. Using this product is simple and straightforward. The winch is compact and reliable though the size might be small, its pulling power is beyond expectation.